When most people hear the phrase “hair loss” their mind goes straight to the top of the head and hair loss associated with balding or thinning. Some people don’t realize that the hair on a person’s eyebrows can be just as vulnerable to the effects of stress, and a loss of eyebrow hair can be even more distressing than thinning hair on the top of the head. How Does Stress Cause Eyebrow Hair Loss? From a scientific standpoint, eyebrow hair is no different than hair located elsewhere on the body. It’s not entirely clear how increased stress causes hair loss. Dermatologists believe that telogen effluvium, a condition where the body tells hair follicles to stop growing hair, is caused by hormones that the body produces in increased amounts as a reaction to anxiety. Further, ‘knitting the eyebrows’—prolonged and persistent rubbing of the eyebrow hair—is a common reaction to stress that can cause patchy growth. Because eyebrow hair takes longer to grow back, these patches can remain noticeable for longer. What Can Be Done to Prevent Eyebrow Hair Loss? 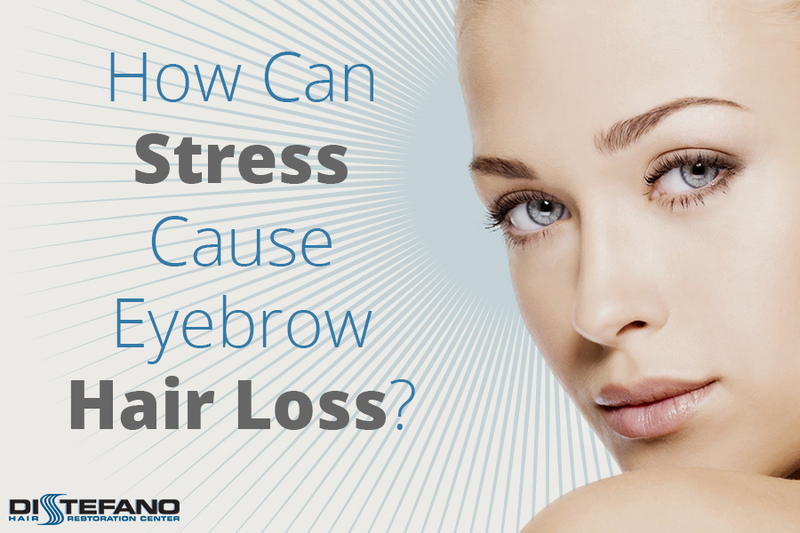 The easiest way to reduce stress-related eyebrow hair loss is to reduce stress. Of course, that’s easier said than done with all the pressure of the modern world. For people who are noticing their eyebrows aren’t as thick as they used to be, the Brow Regenesis™ eyebrow restoration procedure may be just what the doctor ordered. This safe and effective restoration procedure is a reliable, low-risk option for individuals dealing with thinning eyebrows. The experts at DiStefano Hair Restoration Center have performed over 10,000 surgeries. Read testimonials from our patients. If you live in New England and are experiencing thinning eyebrows, we can help. Contact us today by calling (508) 756-4247 or filling out our contact form.